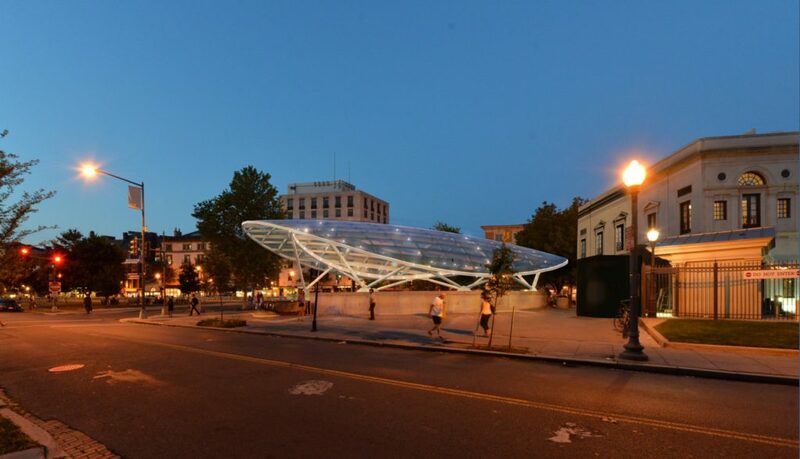 Dupont Circle’s north entrance’s unique size and shape posed an engineering and design challenge because it is significantly larger than other Metro station entrances. The canopy structure will consist of 13 pre-fabricated steel frame modules, connected with bolted joints and supported by seven base brackets resting on the parapet wall. More than 200 individually framed glass panels will form an elliptical canopy 97 feet long by 82 feet wide. Multiple light fixtures will be integrated into the canopy to provide ambient lighting, highlighting the structure and illuminating the iconic Walt Whitman inscription on the parapet wall below.